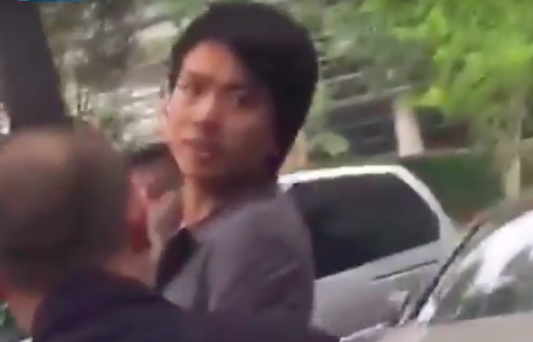 We strongly condemn the violent arrest of a Now TV News cameraman who was reporting on a human rights issue in Beijing, and demand mainland authorities refrain from any further suppression of the work of journalists. A screen shot from a video showing the violent arrest of a Now TV News cameraman. The Beijing-based cameraman from Hong Kong was among a large group of journalists covering a hearing of the Beijing Lawyers Association on the quashing of the professional accreditation of human rights lawyer Xie Yanyi on Wednesday morning. The cameraman holds a press card issued by mainland authorities and produced this identification when requested by a public security officer. When he asked to have the identification back, at least five men including uniformed public security officers pushed him onto the ground. They handcuffed him and took him into a police vehicle before subsequently releasing him. The authorities have not given him any explanation for the arrest of the cameraman, who sustained bruises to different parts of his body during the incident. We call on Chief Executive Carrie Lam Cheng Yuet-ngor to present to the Central Government the Hong Kong people’s concerns over such attacks against journalists. This is the second attack against a Hong Kong journalist within a week. An iCable News journalist was punched by two village officials while reporting on the 10th commemoration of the Sichuan earthquake. We urge the mainland authorities to protect the personal safety of Hong Kong journalists and their legal right to report. Hong Kong Journalists Association, Ming Pao Staff Association, RTHK Program Staff Union, Next Media Trade Union, Hong Kong Press Photographers Association, Independent Commentators Association and the Foreign Correspondents’ Club.